The typical price of an Ultra HD Blu-ray movie is $29.99 (although SRPs are much higher), which is why many consumers may be waiting for the prices to drop before buying. Of course, not many people have Ultra HD Blu-ray players (given there is only one model available in the U.S. and it’s still pricey), but the 4k Ultra HD Blu-ray editions usually include a Blu-ray copy. For those planning on buying a UHD BD player in the future, getting both formats is a wise choice. Best Buy still has all their UHD BD titles priced at $29.99 (although you can grab some titles at discount prices usually upon release — like The Revenant that was on sale briefly for $24.99). 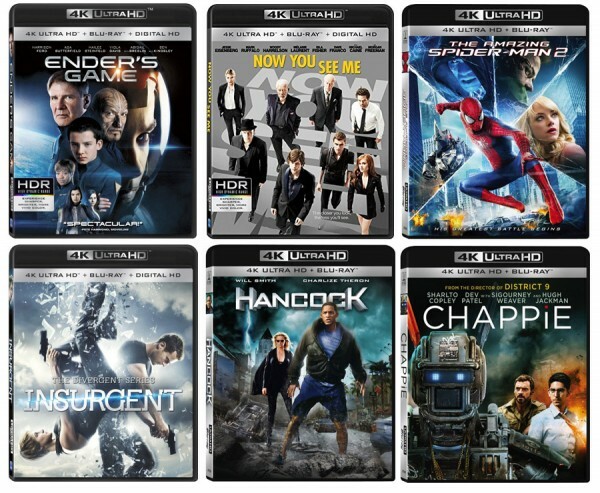 But Amazon has dropped the price of many Ultra HD Blu-ray titles indefinitely. And, a couple of the titles including Ender’s Game and Now You See Me are formatted with HDR specifications for a wider range of color and contrast. Here are some titles under $20 we found while browsing Amazon’s Ultra HD Blu-ray selection. A few blockbuster titles that come really close to the list but are priced slightly higher at Amazon include Expendables 3 ($22.99), Concussion ($22.99), and Divergent ($22.99).